If you want to have some fun seeing firsthand how the polar bears are faring in their native Arctic habitat, keep an eye out for a new wildlife documentary called “Polar Bear: Spy on the Ice” from Director John Downer and the BBC. The film recently aired in the U.K. and is scheduled to show on the Animal Planet and Discovery channels in the U.S. later this year. 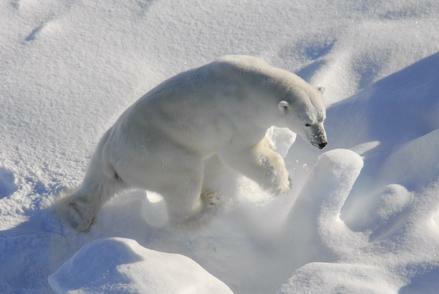 Downer uses a set of special robotic spy cams with names like “Iceberg Cam” and “Snowball Cam” to get up close and personal with his large, furry Arctic subjects. Designed to blend in with the natural Arctic environment, the camouflaged cams look like the latest gadgets from Q’s lab for the next Bond flick. In one scene, a floating cam wanders by for a nose-level view of a lounging mother bear and her cub. In another entertaining spot below, a curious bear balances his two front paws on a cam that holds up surprisingly well for a time, considering polar bears, the world’s largest terrestrial carnivores, can weigh in at up to three quarters of a ton or 1,500 pounds. If you’ve ever noticed that a polar bear has big paws, those large mits help them distribute all that weight more evenly and gently across snow and thin ice. 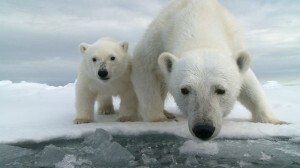 Polar bears are just one of many species affected by poaching, climate change, and other threats to Arctic biodiversity. According to a report by the Arctic Council/CAFF (Conservation of Arctic Flora and Fauna) titled, “Arctic Biodiversity Trends – 2010: Selected Indicators of Change,” 8 out of 12 sub-populations of polar bears with data are in decline. While human harvesting appears to be the primary culprit, climate exchange is suspected to be another factor. To learn more about some of the good work that is being done to protect the polar bears and Artic ecosystem, check out these links to leading environmental organizations and their related Arctic conservation efforts: Conservation International, World Wildlife Fund (WWF).